It's a beautiful day today in Columbus, so I took the dog to the park and decided to do a review of the new release in the Exclusivo blend from Viaje. In the past, the Exclusivo line had been my favorite from Viaje and it has never disappointed. This is the third time this line has been released in the robusto format which is a bit more traditional than the other shapes we have seen in the past. For a good picture of all of the different sizes of the Exclusivo, check out the blog Halfwheel's photo here. Well the dog is off and playing, so it's time to get this stick fired up and see what the 2012 Viaje Exclusivo has in store. 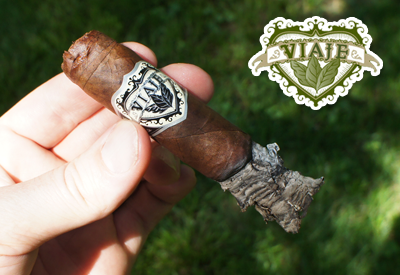 First off, the black and silver Viaje logo on this band is what I consider the best graphic Viaje has. It looks classy but also slightly edgy. It reminded me of the Raiders of the NFL color scheme. The wrapper leaf was a medium brown color with some darker spots in random places around the cigar. There were a lot of very small veins running all over this wrapper, but they were so small it didn't really take away from the look of the stick. The cap had a tiny pig tail which also added a little bit visual of interest. The aroma coming off the unlit cigar was very pungent and smelled like coffee and hay. The cap clipped easily and the cold draw had some pepper and earthy flavors. Instantly when the cigar was lit my palate was bombarded with a strong, spicy black pepper taste. There was so much pepper that not only did it make my tongue tingle, but also the roof of my mouth. I like this type of start to a cigar so everything was all good so far for me. The smoke volume was a little on the small side and the draw was a little tight, but it was nothing too troublesome. What was a bit of an issue was the burn line. 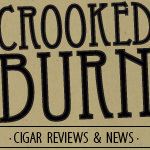 I had to correct the burn during the first third of the cigar multiple times to avoid it running on me. About an inch into the cigar, the pepper calmed down a bit, especially on the finish, which now had a lot of oak flavor characteristics. The nicotine strength of the cigar was a solid medium. 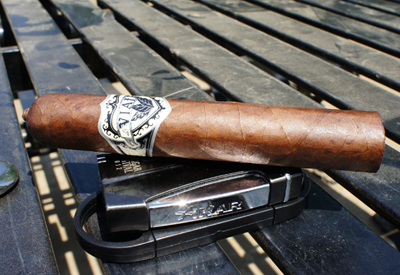 The second third of my Viaje Exclusivo saw a big shift in the flavor department. On the front of each puff, I got a lot of twang that had a dark stone fruit taste. I was hoping this would show up because this is the flavor I have always associated with this line and why I like it the most out of all Viaje products. It's a very interesting flavor and one that I think is unique to this blend. The finish also changed up from the oak flavor into a more dark earthy taste. I'm not sure that taste was the best balance for the front end twang, but it still worked and was not off-putting in any way. Construction-wise, I still had a lot of crooked burn issues with, but the tight draw loosened up and with it, the smoke volume increased. I started to get a bit of a body buzz, so I would say the nicotine level had moved more into the med-full range during the second third. 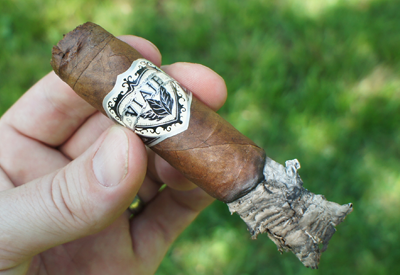 The final third of my Viaje Exclusivo had the same flavor profile as the second third, just stronger. The twangy stone fruit taste was in full effect and, toward the nub, started to even dominate over the earthy finish flavor. The smoke volume stayed consistent with the second third, but, unfortunately, so did the burn. Annoying to keep having to reach for my lighter.. yes, but I'll give it a pass because of how good the cigar tasted. The nicotine strength stayed in the lower full range. 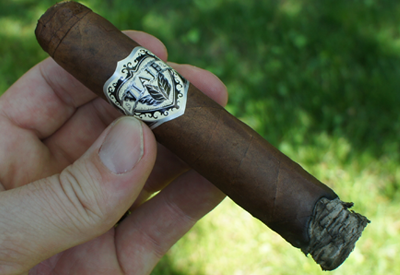 Final thoughts on the Viaje Exclusivo Robusto 2012? This cigar confirmed what I already thought about the Exclusivo line from Viaje; that it's Andre's best. The twangy flavor is very unique and it suits me well. I wonder though if this cigar could be blended to add a bit of sweetness on the finish, as I think that could create more balance to the second and third parts of the stick. 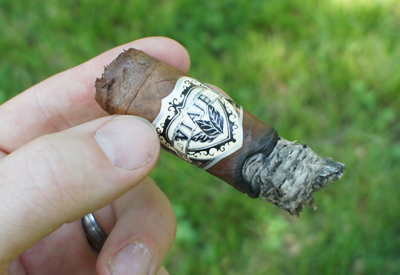 That said, even without that, it's a solid release from the Viaje camp. Would I buy a box? Pricy for a robusto, but box worthy.